UPDATE: First Humax Freeview HD set-top box on sale for £179 this weekend | What Hi-Fi? The first Humax HD-Fox T2 Freeview HD set-top boxes will officially go on sale tomorrow, February 13th, at John Lewis in Oxford Street, London. Other retailers will have it in stock from Monday, February 15th. We're testing it right now and will publish the results in the April issue of What Hi-Fi? Sound and Vision, on sale March 10th. 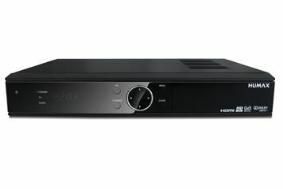 Humax's first Freeview HD set-top box, the HD-Fox T2, will go on sale in February/March 2010 for £179. The price was confirmed today by Graham North, Humax's commercial director, at a press briefing on the company's 2010 product range. North also gave more details on the technical specification of the HD-Fox T2. It will be DVB-T and DVB-T2 compatible, can handle both MPEG2 and MPEG4 video compression and upscales to Full HD, 1080p resolution if required. It can also play digital media content from, and record to, an external USB hard drive. But as it only has one built-in TV tuner, you can't record one programme while watching another. An RGB Scart and HDMI output are fitted as standard, as is an Ethernet socket. The device will also be ready to handle web portal services in the future, thanks to that Ethernet connection, and is also designed to work with Humax's Home Networking Solution. The latter functionality won't be available at launch, but with future software upgrades the HD-Fox T2 will eventually become compatible with your home network via UPnP (universal plug and play) and DNLA (Digital Living Network Alliance) connectivity. "The Humax HD-Fox T2 will be available during the first quarter of 2010," says North. "But we're not chasing to be first in the market [with a Freeview HD box]." In the second quarter of next year Humax will add another model to its Freeview HD line-up, this time a Freeview+ HD recorder with 500GB hard drive. "We hope to launch it in time for the World Cup," says North. Specification will be similar to the T2 but with the addition of the HDD. Other Humax models in the pipeline include a Freesat HD set-top box with BBC iPlayer and the Foxsat-HDR2, a Freesat recorder with 500GB hard drive. Both are due out in the third quarter of 2010. They too will be portal-ready (via Ethernet) and incorporate Humax's Home Networking Solution, but unlike the HD-Fox T2 they will not have 1080p upscaling capability as the UK satellite TV system doesn't support it.